As always in an adventure story like this, the villain can’t just sit back and do nasty things. He’s got to be out there at center stage, openly enjoying the damage that he’s causing. Angelique begs for her life, broken and ashamed. She’s been walking the Earth for centuries, fueled entirely by her desire to take revenge on the man who jilted her. But Nicholas has a bigger agenda, and he couldn’t care less about Angelique’s personal problems. So now we’re watching him saw a lady in half, as he discusses his plans. Barnabas has to live because he created Adam, the enormous Frankenstein who’s currently hiding in an abandoned wing of the house. Reanimating the dead is the ultimate magic trick, and Nicholas needs to know how it’s done. So they’ve finally found something that’s actually evil for Nicholas to do, which is helpful; he’s been coasting on a mustache and a sneer for far too long. But now he’s got a goal, and an opportunity to twirl that mustache. But the important thing right now is that he’s having a good time, enjoying the suffering that he’s creating. It’s not enough for him to just kill Angelique and move on with his evening. He has to play with her, too. Angelique: Nicholas… don’t let me die like this! Nicholas: What a new emotion fear must be for you. I planned it that way. I thought you ought to know how poor Barnabas has felt, so often. I’m trying to help you understand him better, “Cassandra”. Don’t you feel a little sorry for him? Imagine living with fear, constantly. Angelique: Yes… I do feel sorry for him. Nicholas: You should go and beg his forgiveness. And that kind of strikes him as funny. 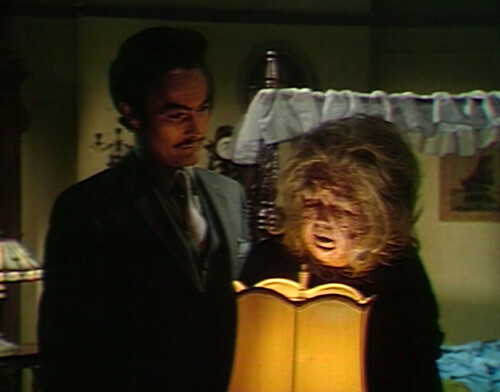 In fact, he’s so amused that he offers her a chance to live, if she can get Barnabas to forgive her. And then he sends her out into the night, for a final discussion with the man that she’s been tormenting for centuries. So the crone nut uses the last of her strength to hobble over to the Old House, and abase herself before her ex-husband. It gets pretty raw. She pleads with him to sit down, and then she sinks to her knees before him. Angelique: Do you feel any pity for me now? Barnabas: Does it matter what I feel? Angelique: Because if you do pity me, I have a chance. Barnabas: To do what? To torture me more? Angelique: To make you forgive me. Yes… forgive me for the injustices I have done — for the wickedness, and the cruelty — for the pain I’ve caused you, and your friends and your family! And now we’re watching a desperately old woman breathing her last, in pain and terror, asking one of your less merciful people for another chance. So here’s a question: Why is this fun for us? We can tell that Angelique’s on her way out, partly because they’ve been making such a big deal about her disobedience for the last few weeks, building up to this moment. There’s also an obvious next step of the story that’s ready to go, with Nicholas taking over as the new Big Bad. It’s another example of the audience’s televisual literacy helping us to follow what’s happening and predict what’s coming up next, based on our innate understanding of narrative structure. Angelique’s humiliation is a way to close this chapter, and start a new one. There’s something sadistic about this, which is a little unsettling when you think about it. Angelique has done terrible things. She’s treated people as if they were insignificant, destroying their lives just to prove a point. She should be punished, and she should be sorry. But then you see an old woman crawling across the floor, shaking and sobbing. Angelique, Barnabas and Nicholas are grotesque and soulless creatures, it’s true. But when the show invites us to revel in their suffering, as it so often does… what does that make us? Tomorrow: Take What You Want. This isn’t a blooper per se, just an odd thing that I noticed: When was it established that there’s a difference between witches and “mortals”? Two episodes ago, Nicholas took away Angelique’s powers, and then said, “You are mortal now.” I think that might be the first time there’s a mention of a witch/mortal divide; there wasn’t any suggestion in 1795 that Angelique or Bathia Mapes were immortal. I believe this might be a little conceptual bleed-through from Bewitched, where they talk about witches and mortals pretty much non-stop. 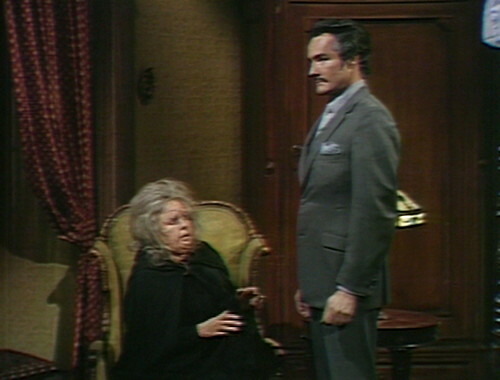 In the teaser, there’s a boom mic poking into the shot over Julia as Roger and Barnabas leave the drawing room. At the start of act 1, there’s an ugly tape edit in the middle of Julia’s first line. Nicholas: He knows something I don’t. Angelique: Will you let me live — do you want me to go to Barnabas? Nicholas: It’s an amusing idea. Angelique: Will you let me live if he forgives me? The front door of the Old House squeaks as Barnabas pushes it shut. 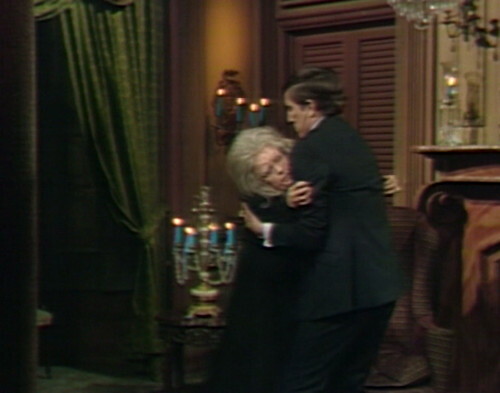 When Barnabas checks Angelique’s wrist for a pulse, the camera pulls back, revealing a boom mic at the top right of the screen. 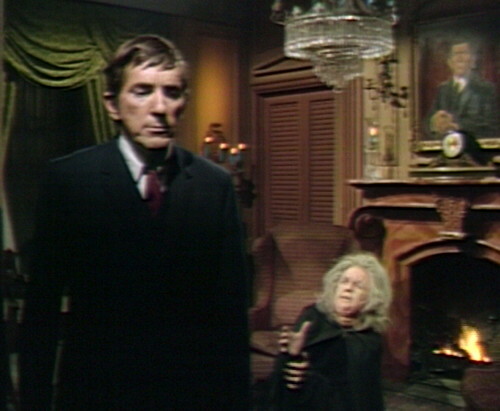 In the fourth act, when Barnabas walks into the Collinwood foyer, the camera wobbles and sways alarmingly as the operator struggles to keep the actors in focus. And another thing: Where the hell is Vicki? In yesterday’s episode, she woke up in the middle of the night, saw the portrait glowing, and showed it to Julia and Roger. This is the same night, and at the end of the episode, Roger makes an acid comment about Barnabas coming to Collinwood at such a late hour. 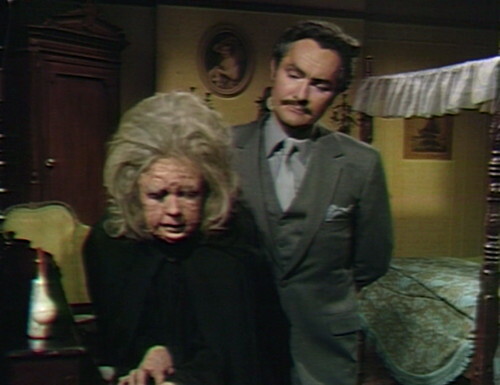 But Vicki apparently never goes back to bed — Nicholas and Angelique have a scene in her bedroom in this episode, and Barnabas and Julia have a scene there in the first act tomorrow. I suppose living in Collinwood makes you something of a light sleeper. Truthy fact: Vicki was in the East wing and discovered the Parallel Time room. She was so entranced by a universe that didn’t include her that she made it her mission to disappear as much as possible. Did Roger send her to Carolyn’s room to sleep? I may be getting this episode mixed up with another one but I do remember that happening somewhere around this time. Things seem ‘strange’ with Vicki since she returned from 1795. She is definitely on the periphery of the show these days. Her and Jeff/Peter’s story is lackluster and she really has no interaction with David anymore. I don’t remember if Alexandra Moltke was pregnant by this time but she has definitely ‘checked out’ for all intents and purposes. Her baby was born in June 1969, so doing the math, no she wasn’t pregnant yet at this point. However, I agree, she has certainly checked out. I’m guessing that had more to do with the writers not knowing what the heck to do with her. 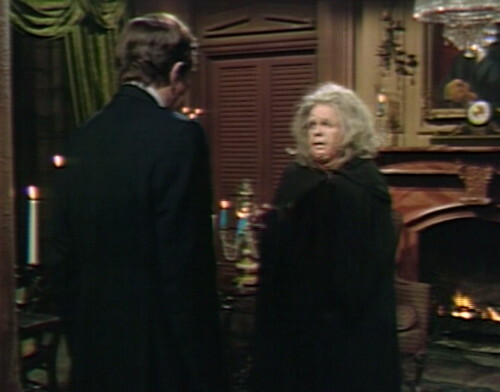 By August 1968 Moltke was openly complaining in press interviews about her diminishing role on the show and about “how dumb” the Victoria character was, telling a reporter from The Daily News how boring it was being nice all the time and answered in a dissatisfied murmur “No such luck” when asked if she was leaving the show, implying that there was a contract that she would have to be let out of first for this to happen, but she was clearly disillusioned with the character of Victoria and her place in the storyline by this point. Julia needs Eric Lang to remind her about her part in the Dave Woodard murder. A clue as to how serious Nicholas is about the “one more chance” he has given Angelique is in the perverse nature behind the theme of the task he has assigned her: forgiveness. How odd for a devil’s emissary to adopt the sort of subject matter typically associated with saints and their prodigals. If anything, it seems that he has sent her off for the convenience of having her expire anyplace else but the house in which he is staying at the moment, so that he can then discuss with Roger the fact of Cassandra’s strange and sudden “disappearance”. It’s almost as if, in the Dark Shadows universe, that the devil doesn’t have a specific plan – he/she/it just likes to see his/her/its followers cause as much trouble and suffering as possible. He/she/it even enjoys watching his/her/its own followers drying to do one another in. It is CERTAINLY real life in this world. Neither actually has a plan. difference between witches and “mortals”? The first indication might be when Cassandra shows up and hasn’t aged since her Angelique days in 1795. 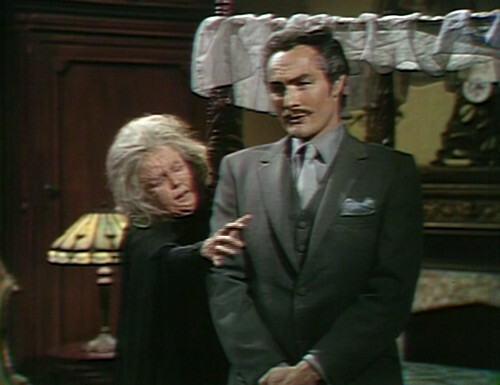 It seems strange now that you’ve pointed it out, but in Bewitched it never occurred to me that the opposite of mortal was literally immortal, probably because we saw many witches of different ages, even elderly witches such as Aunt Clara who eventually disappeared after the actress died. And Samantha’s parents seem to be proportionally older than her. I guess I interpreted mortal as “non-powered” and “short-lived,” while the magic-wielding witches persisted through centuries, but not without aging or eventual death. “Immortal,” rather than immortal. I thought when Angelique returned, she was no longer human. Nicolas’s punishment was to turn her human again subject to all the effects of her real age. Nicholas’ vague bisexuality troubles me — he’s too straight to be gay and too gay to be straight. What is he? Maybe he’s just a natty metrosexual. I’m not feeling him. I was much more a witchcraft/Angelique fan as a teen than I am now. The powers of Angelique and Nicholas are just so damn random; they are so powerful one episode and yet all kinds of mortal things are going on right under their noses. A mundane thing like “where will I live” takes up too much time. Just cast a spell on Roger that you can stay there. That’s that. And that pose Nicholas strikes when he’s conjuring spirits just looks stupid. I’m cranky today. Yes, but Nicholas doesn’t actually want to stay in Collinwood, does he? When you have a vague plan to team up with a reanimated corpse who’s wanted by the police, and then want to do some experiments of your own on dead body parts, it’s probably a good idea to have a place of your own. Why is that chair in the Old House so thrashed? 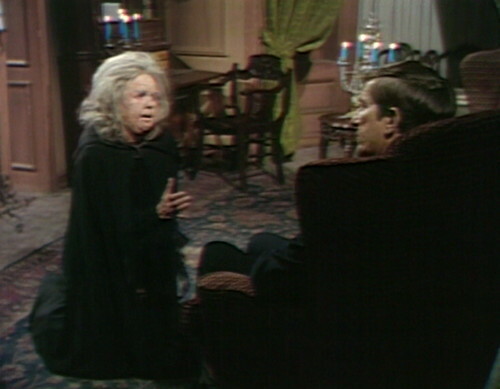 The one Barnabas sits in has a crumpled seat cushion—especially noticeable in this episode.